Véronique Nichanian has been in command of Hermès’ menswear division for the past 27 years. Since 1988 she has been commenting on men’s mannerisms through her collections. “The way they can be driven by refinement,” she said in an interview with the Business of Fashion. I can attest to this. Being fastidious is what makes a well-dressed man tick. The way the shirt is tucked or untucked with the trousers, which may or may not be rolled up, to show off the exposed ankle and the sneaker or boot. The particularities of all those things have to be pinned down before casting a glance at oneself in the mirror. Nichanian gets this. Her Hermès collections reflect the statement. Every detail has been given thought. An animated movie is edited prior to the commencement of filming. An Hermès menswear collection evokes this vibe. The ideas have been precisely measured and the result is a neatly combined sequences. Womenswear collections can often begin to go astray, but a menswear Hermès collection is the opposite. There is simply no room for this. Plain trousers were seen in this collection. An easy sell. Grey, light blue, taupe, brown, black and white. There was a pleasant variety. Although the bottom half may have been simple, the top half of the looks captured the attention. Adding an artistic element to the collection, a swirling print in subdued tones was splashed across a jacket. A red snakeskin hoodie enlivened boring grey slacks. An abstract print decorated a summery shirt. One blazer was festooned with green florals, another with stripes and clovers. The snakeskin bomber jacket was an exciting staple within the collection. I’ve looked at some menswear collections and seen ones that get as strange as the women’s collections and others that are hopelessly mundane. This collection has finds a middle ground. The jackets were by no means ostentatious. The trousers in a subtle mint hue and an off-white were further afield than what would be expected. 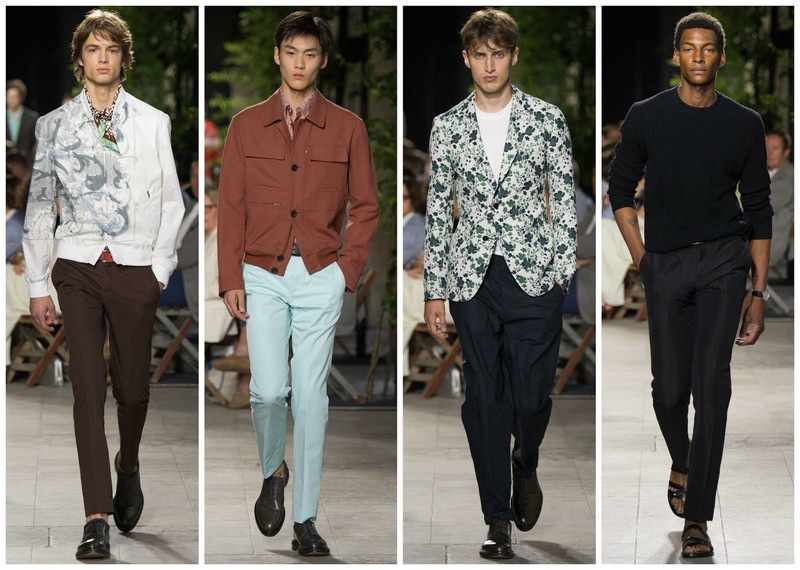 As the customer, I find it very hard to be pleased by menswear collections. If I’m going to invest money in designer clothes, I need to be ensured good quality and stylish flair. I need to look no further than Hermès menswear, thanks to Véronique Nichanian’s genius, to assuage that desire.